Students can choose any course offered by the University of Wollongong subject to prerequisites. The curriculum includes a huge range of subjects: Business and Economics (accounting, business information systems, e-Business, economics, finance, financial planning, human resource management, international business, management, marketing and advertising, public relations and supply chain management/logistics), Creative Arts (creative writing, graphic design, music, photography and visual arts), Computer Science and Information Technology (Big Data, business information systems, computer science, cyber security, mobile computing, social policy and web design), Education (early childhood, education for change, health and physical education), Engineering (civil engineering, computer engineering, environmental engineering, mining engineering), Environmental Sciences (biological sciences, conservation biology, geology, land and heritage management, marine science), Health and Medicine (health administration, health promotion, indigenous health, nutrition, public health), Humanities (languages, history, philosophy, writing and English literature), Indigenous Studies, International Studies (global sustainable development, international relations), Mathematics and Statistics, Media and Communications (digital media, global media, journalism, marketing and advertising), Psychology, Social Science (criminology, human geography, sociology) and Social Work. 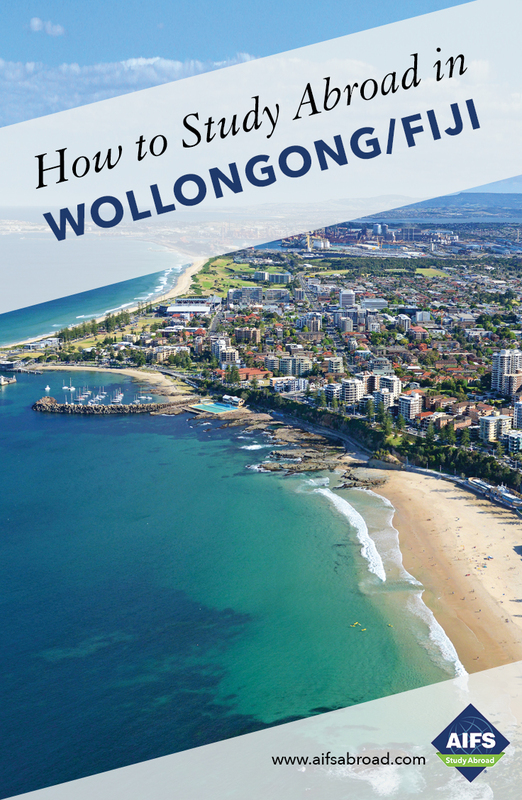 The Full Curriculum program at the University of Wollongong is designed for students wishing to study in Australia and choose from the University’s entire curriculum of courses in a wide range of disciplines. Courses are worth 6 or 8 Australian credit points each and are equivalent to 3 or 4 U.S. semester credits respectively. The minimum course load is three and the maximum is 4 for a recommended 12 - 16 semester credits depending on course selection and level. Students are advised that the workload per course is heavier than in the U.S. and should consider taking only 3 courses. Choose this optional program before your semester in Wollongong begins and learn about the indigenous Fijian culture while exploring all that this paradise island has to offer. The Pacific Studies program is geared towards giving students a basic understanding of the cultures, art and way of life of the Pacific Island countries and the challenges they face over the influences of technology and globalization. The Work Integrated Learning subject, COMM 391 Business Internship is a 6 Australian credit point subject (the equivalent of 3 U.S. credits) designed for sophomore or junior Business or Commerce majors and provides an opportunity for students to integrate and apply their academic learning in an industry context. The internship requires students to undertake 16 days in an organization selected by the faculty of business in addition to classroom-based learning and in-class assessments. Contact the AIFS Admissions Officer for further information on admissions requirements and prerequisites. Students accepted onto this program are required to enroll in at least one other subject from the faculty of Business along with COMM 391 plus one or two more subjects to make up a full-time study load. The University of Wollongong (UOW) was rated among the top 2% of universities worldwide, as well as in the top 50 universities under 50 years old. The UOW Campus stretches over an impressive 83 hectares (205 acres), offering world class, modern facilities and an all-inclusive living environment, complete with convenience store, sports center, bar, post office, doctor, 2 banks (7 ATMs), movie theater, hair salon, travel agent, bookshop and lots of coffee shops and eateries. A wide range of courses are on offer across many subjects, as well as opportunities for internships and over 100 extracurricular clubs and societies. Interested students can also benefit from some specialized subjects on offer such as Asian Pacific Studies, Australian and Indigenous Studies, Environment and Ecology of Australia and Indigenous Health and Landscape. Studying abroad at UOW will give you the opportunity to expand your academic and cultural portfolio with enriching, life-changing experiences.